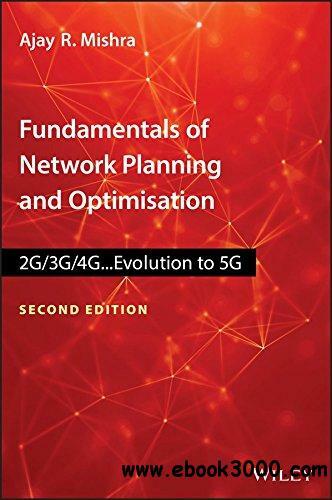 Updated new edition covering all aspects of network planning and optimization This welcome new edition provides comprehensive coverage of all aspects of network planning in all the technologies, from 2G to 5G, in radio, transmission and core aspects. Written by leading experts in the field, it serves as a handbook for anyone engaged in the study, design, deployment and business of cellular networks. It increases basic understanding of the currently deployed, and emerging, technologies, and helps to make evolution plans for future networks. The book also provides an overview of the forthcoming technologies that are expected to make an impact in the future, such as 5G. Fundamentals of Cellular Network Planning and Optimization, Second Edition encompasses all the technologies as well as the planning and implementation details that go with them. It covers 2G (GSM, EGPRS), 3G (WCDMA) and 4G (LTE) networks and introduces 5G. The book also looks at all the sub-systems of the network, focusing on both the practical and theoretical issues. Provides comprehensive coverage of the planning aspects of the full range of today's mobile network systems, covering radio access network, circuit and packet switching, signaling, control, and backhaul/Core transmission networks New elements in book include HSPA, Ethernet, 4G/LTE and 5G Covers areas such as Virtualization, IoT, Artificial Intelligence, Spectrum Management and Cloud By bringing all these concepts under one cover, Fundamentals of Cellular Network Planning and Optimization becomes essential reading for network design engineers working with cellular service vendors or operators, experts/scientists working on end-to-end issues, and undergraduate/post-graduate students.